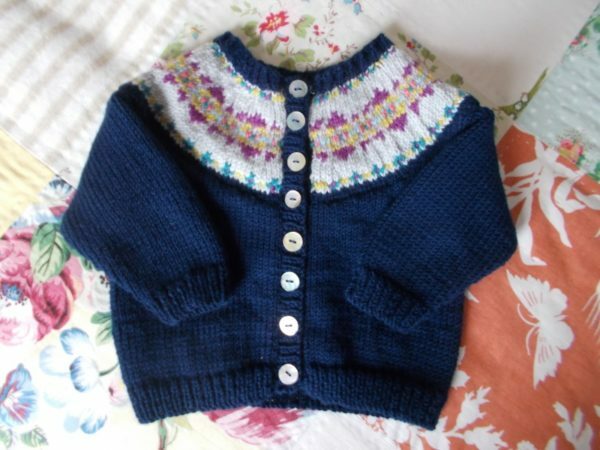 Another new baby provides the perfect excuse for just the right sort of knitting – a bit of Fair Isle, not to much plain knitting and no lengthy seams. 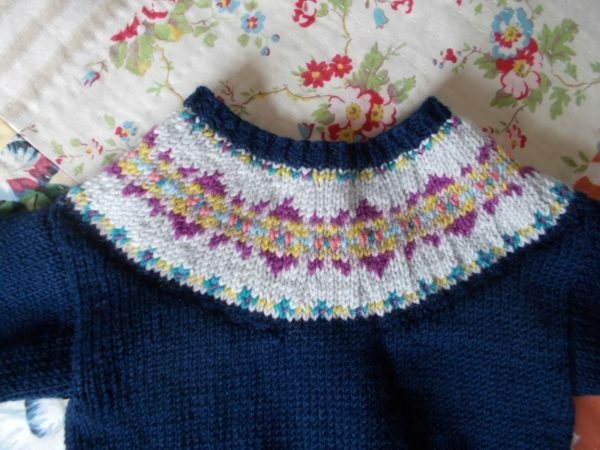 I did agonise a bit about the Fair Isle design, not wanting to overwhelm a tiny person with the sort of big bold pattern I have my sights set on at the moment so the resulting cobbled together design for the yoke is a bit underwhelming, but I think it has a certain charm. “Hamilton: You pay him in advance, you treat him with civility. An Enlightenment man in the European mould Hosack sailed to Europe in 1792 to complete his medical studies. In Edinburgh he realised how limited was his knowledge of medicinal botany, so he moved to London (the capital of both botany and anatomy) where he attended a private medical school in parallel with learning from the botanist William Curtis at work first in his Brompton Botanic Garden and then in the garden we have come to know as the Chelsea Physic Garden, spending as much time in the garden and greenhouse as in the lecture theatre. Curtis cultivated American species in ever greater numbers and Hosack began consider the potential botanical richness of the vast American wilderness beyond the East Coast settlements. In 1796 he returned to America where he established himself as a doctor and devoted family man. Botanical interest never lapsed. He set up and was the first president of the New York Horticultural Society with Adams, Jefferson and Madison as founding members. This was not enough for a man of vision and prodigious energy and in 1801 he bought land beyond the city for a botanic garden to be devoted to the study of indigenous plants. 4 miles from his Broadway home, getting to the land with men and equipment was a major expedition but he persevered, irrigated the site, brought it to productivity and built huge glass houses for the study of plants of tropical temperament from hotter parts of the country. For too few years medical students studied alongside botanical researchers, observing, classifying and trialling. But such an enormous endeavour could only gorge on money and Hosack’s own purse was nearing empty. Promised funding from public bodies materialised too late and was anyway too little – considerably less than Hosack had paid for the land, with no consideration for value added from cultivation, building and the stock of plants. New York State bought the land in 1810. In 1812 marble slabs were placed along the Middle Road – the beginnings of the grid system later to characterise New York’s street plan. The Middle Road became Fifth Avenue. The land was made over to Columbia College in 1814 and garden and buildings fell into decay and dilapidation as the university had no interest in such botanical pursuits. In the 1920s the land was leased to John D. Rockefeller Jr. Today it is the site of the Rockefeller Center, so when you go for a winter skate on the ice rink there, try to imagine being out in the country with no skyscrapers just a few greenhouses and greenery as far as the eye can see. Radio City Music Hall was built over the footprint of Hosack’s conservatory. On a low wall in Channel Gardens hangs a plaque in memory of Hosack and his garden. sic transit gloria mundi – again (or rursus in Latin). In 1816 Hosack was made an FRS (Fellow of the Royal Society) – a fully fledged fellow and not just a foreign member – a rare accolade. Two wives and two children pre-deceased him but he found happiness – and wealth! – with his third wife. With her he bought a Hudson River Estate and established his second botanical garden which gave meaning to his final years. Andrea Wulf’s two excellent books on American gardeners The Founding Gardeners and The Brother Gardeners are remarkable for containing no mention of Hosack. Wulf herself has praised Victoria Johnson’s book and her research into this forgotten man, which just goes to show how easy it is to slip between the cracks in the floorboards of history. 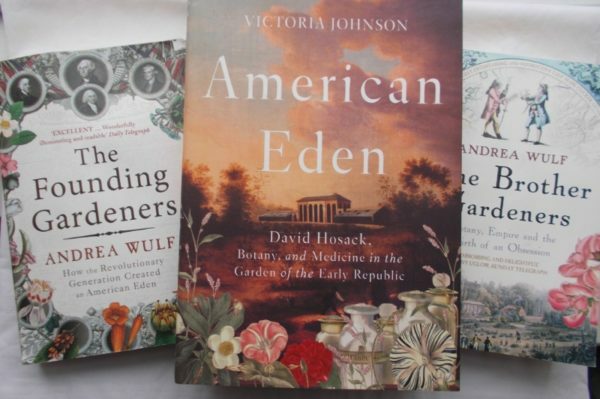 I’ve blogged about Wulf’s books here and, loved them – having read them twice, I know I will read them again, as I shall with Victoria Johnson’s American Eden, and I shall do it with a great vernal sigh of pleasure. Cheltenham Art Gallery and Museum was renamed The Wilson in 2013 when it reopened after rebuilding. Edward Wilson, son of the town, medical doctor, natural historian and painter is best known as a polar explorer who took part in two British expeditions to Antarctica, both on the Discovery Expedition and the Terra Nova Expedition under the leadership of Scott. (The wider Wilson family were also very supportive of the museum in its early years.) However, fine chap as Wilson was the renaming of the museum in his honour has not been uncontroversial. Cheltenham Art Gallery and Museum clearly was what its name suggested, while to the uninitiated The Wilson could be anything – pub, theatre or cinema (not so far fetched, the cinema in my own home town where Lord Byron the poet is buried is called The Byron!). I even once heard someone suggest The Wilson was a museum devoted to Harold Wilson, one time British Prime Minister, who, as it happens, has nothing at all to do with Cheltenham! Wakefield City Art Gallery and Museum has gone down the same path as The Wilson and is now called The Hepworth, after Barbara Hepworth, although her exhibits are only a small fraction of the museum’s internationally important collection. Goodness, it was bad enough when Opal Fruits sweets became Starburst and Marathon chocolate bars became Snickers but at least they didn’t leave you disorientated in a town you’d never before visited. Let’s hope sanity returns and the name of a building can once more directly refer to what it’s all about inside. Rant over, The Wilson has much about it to love as I hope intermittent posts on some of my favourite things will show. The Arts and Crafts Collection is a designated national collection of international importance and mouthwatering loveliness which is always a good place to wander into when your spirits need lifting or inspiration is in short supply. Marquetry, dovetailed joints, hammered silver set with semi-precious stones and enamelling, lustreware crewelwork, pargeting, printed textiles and painting – the Arts and Crafts Gallery thrusts at you work of hands that glorify the makers and enthuses the viewer. Cheltenham also has a splendid costume collection which I was told is second only to that in Bath in the UK. Sadly there is no longer space to exhibit, or even properly to store this at Cheltenham; many people recall how for a few short years it occupied the top floor of the now underused Pitville Pump Rooms. Fingers crossed that the costumes will not languish unseen for long. 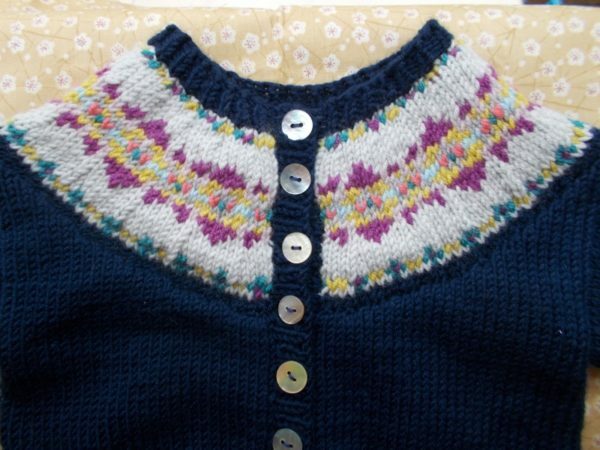 When my husband showed the picture at the top of the blog at a recent U3A (University of the Third Age) meeting, it drew many sighs of pleasure and recognition. Although the oil lamp suggested it was not contemporary, many felt the image had a timeless quality. You could so easily have sat down beside the reader and budged her up so as to feel the heat from the fire more – though of course that would have ruined her stillness and absorption in her reading, and thus the mood of the painting, so you would never have done anything so cataclysmic. A second person is apparent in the picture for their absence. An abandoned newspaper at the side of the less comfortable chair suggests their reading was not as absorbing – perhaps they were off in the kitchen making tea. I do hope so. 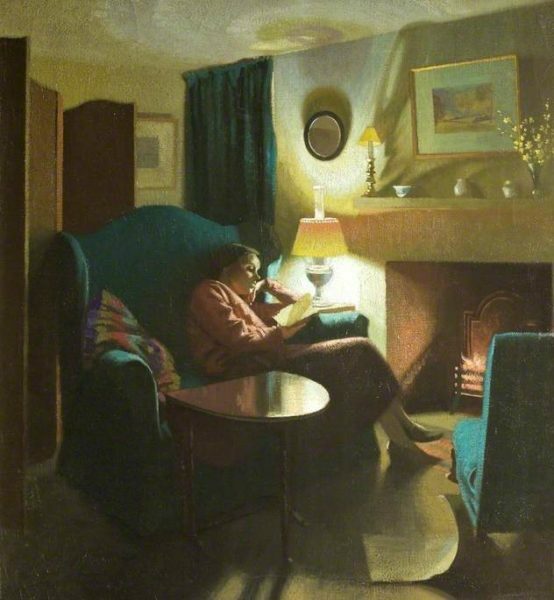 Painted by Gerald Gardiner (1902-1959) and dated 1935, ‘The Artist’s Wife Evelyn, Seated Reading’, unlike ‘The Wilson’, tells you exactly what you wanted to know about the painting, except you might like to know the room was in their own cottage, in Lower Nash End, Bisley, in the South Cotswolds. 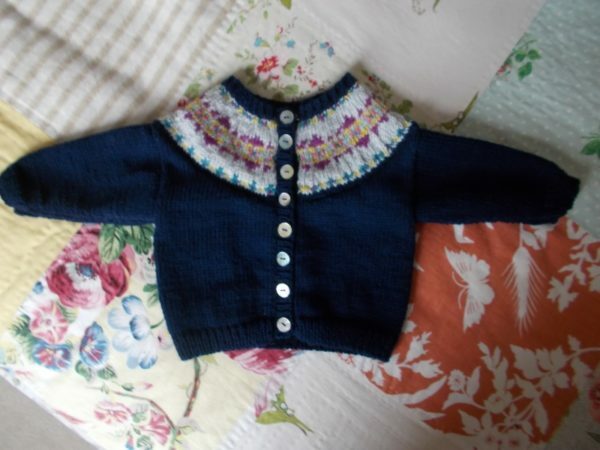 My husband lived in a similar cottage in the same village some forty years later and recalls winter life in a stone cottage built into the hillside – minimal heating, undiagnosed drafts and heavily curtained doors. Brr. Gardiner seemed to like painting his wife in a world of her own for another painting shows her pooled in sunlight languid on a day bed, happily kitting. Once more, we are tempted to join her. Lamp light/firelight or sunlight, Gardiner makes the light peculiar to winter or summer equally entrancing. 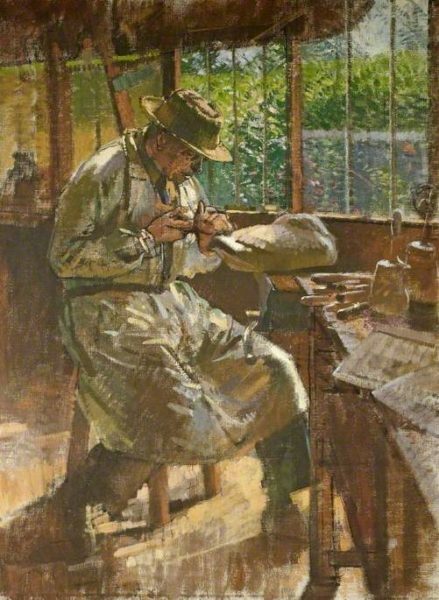 Also in the Cheltenham collection is Gardiner’s painting of a Cotswold woodcarver, William George Simmonds (1876-1968) at work in his workshop at Far Oakridge. Cheltenham has a few of Simmonds carvings on display – in particular this wonderful little calf which children love – my grandson makes a bee line for it. Called Autumn calf, it is painted oak but we call it the chocolate calf – self explanatory really when you see it! For such realistic and tangible animal sculptor, it is a surprise to learn he studied painting under Walter Crane, known for nursery rhyme characters and fairies, although Simmonds’ skill at making and performing with marionettes suggests there was a fantastical element to his imagination too. 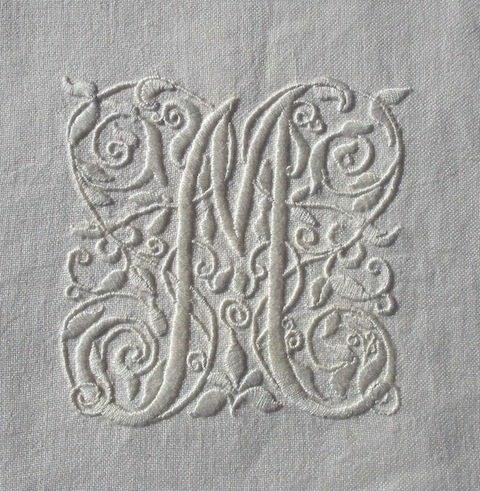 Like Gardiner his wife was named Evelyn and interestingly she was a skilled embroiderer. 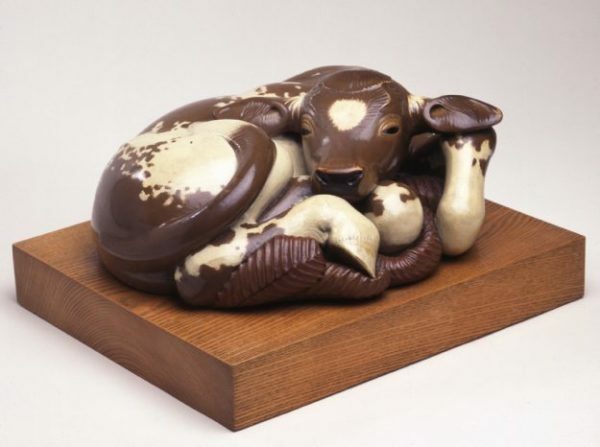 When I decided to blog the painting of the lamplit reader, I never thought I connect it directly to another favourite exhibit, the chocolate cow. I hope The Wilson has many more chains of connection for me to uncover.